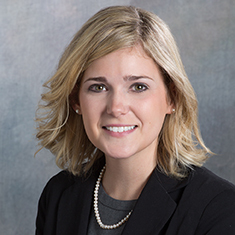 Lauren Nance focuses her practice on commercial real estate due diligence. She has considerable experience reviewing complex titles and addressing survey and zoning issues for lenders and purchasers in commercial real estate transactions involving office buildings, industrial facilities, retail facilities, and single-family and multifamily developments and condominiums with deal values up to $80 million. Additionally, she has experience in foreclosure litigation, residential mortgage modification negotiations and landlord/tenant issues. She has analyzed and determined the best course of action on delinquent or potentially delinquent mortgage loans and utilized knowledge of federal laws relating to financial privacy, fair lending, collections, bankruptcy and foreclosure. Prior to joining Katten, Lauren served as an intern in Legal Aid's Domestic Violence department. While in law school, she served as the Student Bar Association's vice president.